A secure, cashless solution that streamlines cash flow while offering patrons convenience and simplicity in an online environment. ITC Systems’ Vending Terminals offer the ultimate in cashless vending. 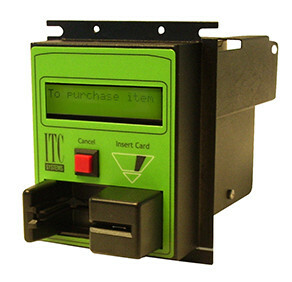 Each reader ﬁts into the standard bill validator cut-out found in most MDB vending machines. The hardware can be installed in conjunction with the existing coin and bill acceptors or can operate independently. The Vending Terminals enable the use of a vending machine through an encoded magnetic stripe card, contactless or bar coded card.